The rich history of The Aggie War Hymn, the official war hymn of Texas A&M (Texas A&M does not have a fight song), dates back to World War I. The lyrics to the iconic song were scrawled during 1918 on the back of a letter from home by J.V. “Pinky” Wilson, one of the hundreds of Aggies who fought during World War I, as Wilson sat in a trench during a battle in France. Wilson originally called his song “Goodbye to Texas University,” a nod to Texas A&M’s rivalry with the University of Texas, and created it by combining several Aggie yells used at the time to form the lyrics. Rough Tough! Real Stuff! Texas A&M! The Spirit of Aggieland is the alma mater of Texas A&M, originally written as a poem in 1925 by Marvin Mimms, Class of 1926. 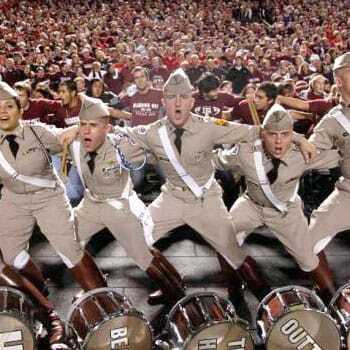 The music was authored by Col. Richard Dunn, director of the Fightin’ Texas Aggie Band. The song was composed to be more somber in contract to The Aggie War Hymn so it could be played at ceremonies like Muster. The Spirit of Aggieland was performed for the first time at a 1925 Midnight Yell. The Aggie War Hymn was rated as the No. 1 college fight song by USA Today﻿. But there’s a spirit can ne’er be told. It’s the Spirit of Aggieland. The first time I witnessed students sawing Varsity’s horns off, I wasn’t an Aggie, but was moved by the visible and unified act of school spirit. Other schools have chants and cheers, but only Aggies lock arms with one another and sing at the top of their voices about their burning desire to beat their long-time rival. The Aggie War Hymn is as unique as the school and the student body which so proudly sings it. My dad brought me to my first Texas A&M game when I was 8. You will never find a fanbase as devoted and inspired as the Fightin' Texas Aggies. I received my acceptance letter to A&M last night. Gig 'Em Aggies!